You know those great little tags that come with purchased plants. They are packed with all sorts of great information — like how and where the item should be planted, care issues and more. And, of course, there is the name/variety of what it is you are planting right there on the top of the tag. We’ve seen lots of folks stick those tags into the soil right next to the seedlings, and truth be told that even though we understand why they do that (so that they will have all that information right there by the particular plant) — it still looks pretty tacky in the garden. Plus, given a few weeks in the sun and heat or cold, those little plastic tags often fade out or worse, break off. This colorful and informative tag will be inserted into the soil next to its accompanying plant so that just the top of it can be seen. Handy, yet out of sight, it will be there when and if you need it. There is a better way. No need to try to keep a notebook or file those tags somewhere else. 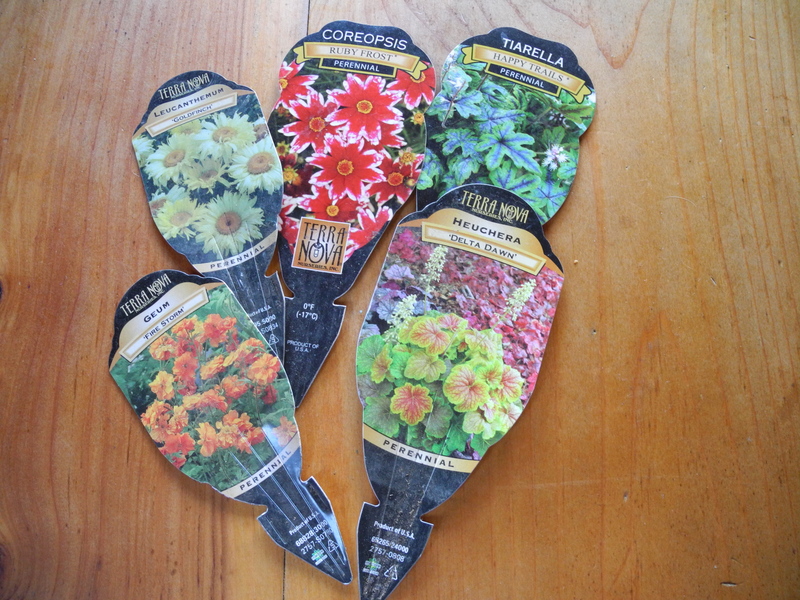 Instead sink your garden trowel or shovel into the dirt near the planted item, essentially making a “slot” in the soil. Then insert the plant tag into that slot so that just the tip of it can be seen above the soil line. Smooth out the soil, and VIOLA! Your tag is right there with the associated plant, ready to be retrieved when needed. It looks better and you’ve still got that tag. Problem solved! Making the most of the harvest can sometimes get boring. serving the same vegetables the same way over and over. Wanting to mix up the vegetable meals, I came up with this pie chock full of garden produce. I used a combination of vegetables that I had on hand and topped it with a hearty sesame-seed-whole-wheat pastry made with olive oil. Feel free to vary the filling ingredients. For instance, corn or perhaps a bit of celery, leeks, cauliflower or broccoli, edamame, fresh or even frozen peas, winter squash, sweet potatoes, even a bit of fresh spinach would be great in this dish. Use your imagination. Peel carrot and parsnip and place along with potatoes and the 1/2 teaspoon salt in a heavy saucepan and cover with water. Bring to a boil and simmer, uncovered, until vegetables are about half cooked. Add green beans, bring to a boil and cook about three minutes more to blanch green beans and slightly cook them. 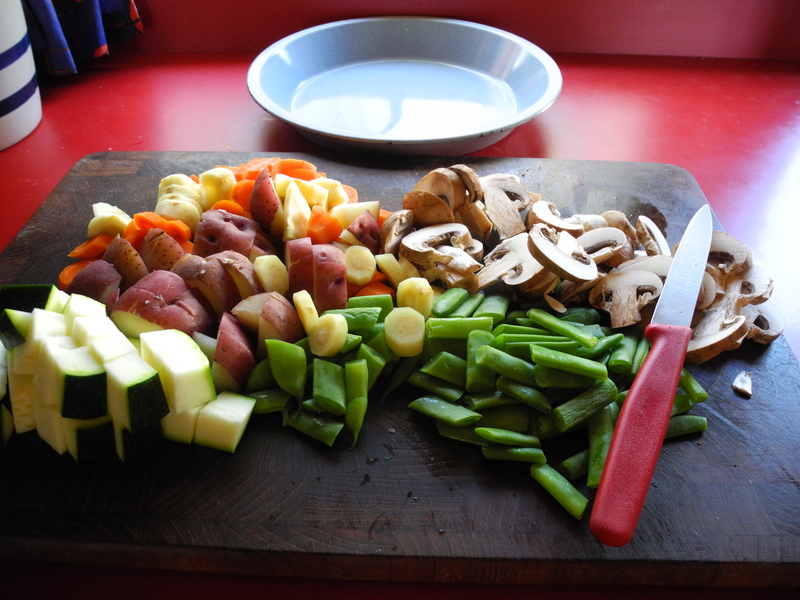 Remove vegetables with a slotted spoon and let cool to handle. When cool, slice carrot, beans and parsnip diagonally into bite-sized pieces and cube potatoes. Combine with zucchini and mushrooms and pile in a 10-inch pie plate or other suitable baking dish. You should have about six cups of vegetables. In saucepan measure two cups of the reserved vegetable cooking liquid. Stir together the sour cream and flour and add some of the cooking liquid to that mixing until smooth. Then pour flour mixture into saucepan with the rest of the cooking liquid. Add the balsamic vinegar and bouillon cube, stirring over medium-high heat until mixture boils and thickens slightly. Season to taste. Pour this mixture over the vegetables in the pie pan. Top with pastry and bake at 375 degrees for approximately 45 minutes, until top is browned and filling bubbly. Serves four. Combine flours, salt and sesame seeds. Stir in olive oil to make a crumbly mixture. Stir in water to form dough. Roll dough into thin 12-inch circle between two sheets of waxed paper. Fit dough to top of pie pan over vegetable filling and cut steam vents.